Even if you have been out of school for many years, you probably remember how difficult it was to go back to classes after the holiday break. Whether it was only a few days off for Thanksgiving or a week or more for Christmas and the New Year, those first few days back could be a struggle. If you want to help your child avoid that post-holiday haze, we have a few helpful suggestions that can make their breaks more fun and more educational. For an education that meets all of the state’s standards but also places a deeper emphasis on integrating culture and the arts, The Academy of Arts & Knowledge in Fort Collins is an excellent choice. We are a charter school that is dedicated to helping children learn, grow, and foster their natural artistic gifts while providing them with a solid base of knowledge that will prepare them for the rest of their school career and beyond. Contact us today to learn more, or check out our site for instructions about applying, as well as information about how our school is the best option for your talented, artistic child. The holiday season is full of gift-giving. While most people buying gifts for your kids mean well, most toys don’t have a lot of educational value. While we are not saying that your child should not have toys — playing is a vital and important part of creativity, after all — adding a few educational toys, games, or books into the mix is never a bad idea. There are so many fun items out there that educational toys don’t even seem like a chore. Spend time with your child as they play or read these books and ask them to teach you something that they have learned from using these items. As much as kids like to learn, they also like to teach. Explaining something to others is an excellent method of helping them retain or better understand. Are you going out of town to visit family or friends over the holidays? If you are, try to incorporate something educational into the travel. Whether that means learning about how airplanes work or it means that you stop at a museum (or two, or three), almost everything you encounter during a trip can be a great opportunity to keep your child’s brain working. 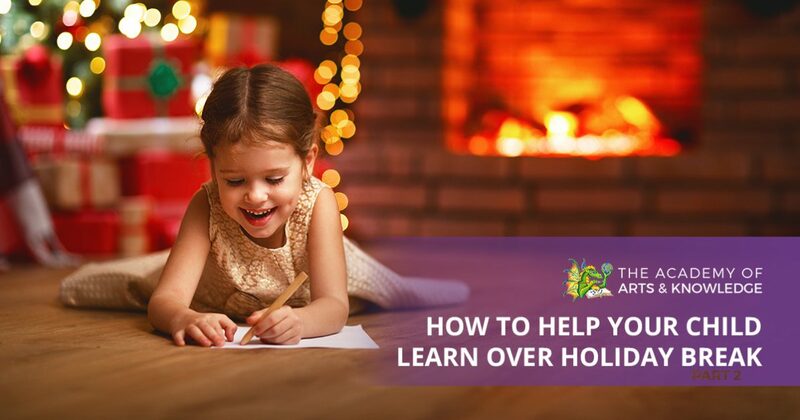 While there are many other great ways to help your child learn while you are off during the holidays, we hope that you found these examples useful. One of the best ways to keep them thinking and learning is to allow them to pursue their own interests or to apply what they like to something educational. If your child is discovering music, teach them about some of the math that underpins music theory or show them what sound looks like when it is played through on oscilloscope. The important thing to remember during the break is that young brains want to be challenged and expanded. Finding ways to deepen their knowledge will only help them and it offers a great way for you to spend more time with them. When you want your child to have an excellent education in Fort Collins, think The Academy of Arts & Knowledge. We have a staff full of highly qualified and incredible teachers who can’t wait to help your child learn. Browse our website to see if we would be a good fit, learn about the ways that make us different from other charter schools, and find the information you need to apply. If you have any questions, feel free to reach out. We would love to discuss how we can provide the education your child deserves.